Active, accessible, and assuming no prior knowledge: the ideal text for biologists encountering bioinformatics for the first time. A vast amount of biological information about a wide range of species has become available in recent years as technological advances have significantly reduced the time it takes to sequence a genome or determine a novel protein structure. This text describes how bioinformatics can be used as a powerful set of tools for retrieving and analysing this biological data, and how bioinformatics can be applied to a wide range of disciplines such as molecular biology, medicine, biotechnology, forensicscience and anthropology. Fully revised and updated, the fifth edition of Introduction to Bioinformatics contains a host of new material including new content on next generation sequencing, function prediction, sequence assembly, epigenomics, the bioinformatics of gene editing, and the effects of single nucleotide variants. 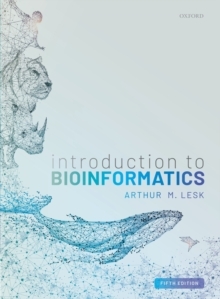 Written primarily for a biological audience without a detailed prior knowledge of programming, this book is the perfect introduction to the field of bioinformatics, providing friendly guidance and advice on how to use various methods and techniques. Furthermore, frequent examples, self-test questions, problems, and exercises are incorporated throughout the text to encourage self-directed learning.